L-R: Senate Chief Whip, Senator Prof. Olusola Adeyeye; Director General, National Agency for Food and Drug Administration and Control, NAFDAC, Prof. Mojisola Adeyeye; President, Prince Julius Adelusi-Adeluyi, Vice President, Sir Ifeanyi Atueyi and Secretary, Prof. Fola Tayo all of the Nigeria Academy of Pharmacy at the Special Reception in honour of the two distinguished fellows by the Nigeria Academy of Pharmacy which held at the Lagos Sheraton Hotel. Pharmacists have urged the federal government to retain medicines on the Exclusive List as contained in the Nigerian constitution, noting that its movement to the Concurrent List would worsen the problems of drug distribution and regulatory control across the country. 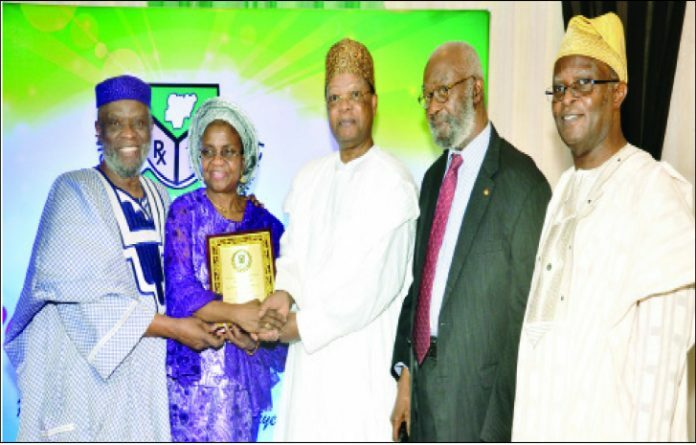 The Nigeria Academy of Pharmacy made the call, weekend at a special reception it held in honour of two distinguished fellows of the Academy. They are Prof. Mojisola Adeyeye, Director-General of the National Agency for Food and Drug Administration and Control (NAFDAC) and Prof. Chinedum Peace Babalola, Vice Chancellor, Chrisland University for their outstanding achievements in public service. Notable pharmacists who spoke at the event stressed that it would be counter-productive and exceedingly damaging to the country to move medicines to the Concurrent List as being advocated in some quarters. Speaking at the event, Prince Julius Adelusi-Adeluyi, the President, Nigeria Academy of Pharmacy said; “medicines are currently on the Exclusive List (item 21 of part 1 of the second schedule of the 1999 constitution) and though there appears to be an ill-advised move to remove it from this list to the Concurrent List, the Academy wishes to strongly advise that the health needs of Nigerians are best served by retaining medicines on the Exclusive list. He lamented that Nigeria had clearly transited from being a mere courier country to one in which young people now actively abuse drugs and hard substances. He said there’s need for aggressive regulatory control backed by legislation to control the availability of drugs and other controlled substances across the country. “We have intercepted many containers of illegal substances as I speak. There must also be a communal approach to tackling the issue by propagating the right message that illicit drugs can damage the brain and ruin lives. Community and religious leaders must drive and champion this cause of fighting substance abuse,” the NAFDAC’s DG noted. It’s worthy to note that Prof. Adeyeye is the first African woman to bag the fellowship of American Association of Pharmaceutical Scientists (AAPS) in the US having served as the Founding Chair of the Department of Biopharmaceutical Sciences at Roosevelt University, Illinois. Similarly, Prof. Chinedum Babalola who has had a distinguished career as a drug development expert, researcher, teacher and mentor to undergraduates and young pharmacists expressed her joy at being recognized by the Academy. “I am happy to be so honoured by the Academy. I am not a competitor in the world of men but I also want to achieve that which is made possible by my husband. It is my vision that the university would be the best in terms of pharmacy and medicine as a centre of excellence because I cannot leave there without making the mark,’’ she said. Prince Adelusi-Adeluyi however called on the government at different levels to help provide support especially with regards to legislation as well as enforcement, to enable NAFDAC deliver impeccably on its mandate. Dignitaries who graced the event include the Senator representing Osun Central Senatorial District and Senate Chief Whip, Senator (Prof.) Olusola Adeyeye; Chairman, Association of Pharmaceutical Importers of Nigeria (APIN) Pharm. Nnamdi Obi and Deputy Vice Chancellor (Academic), Nnamdi Azikiwe University (NAU), Awka, Prof. Charles Esimone etc.